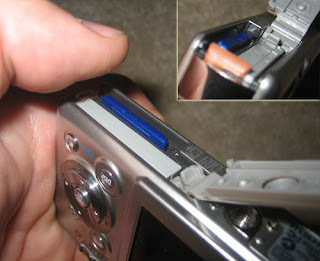 "I found my flimsy 1/2 millimeter of keratin fingernail structurally too weak to disengage the spring or whatever that holds onto the card in the camera's slot." Fortunately, the fake nails of a colleague came to the rescue -but, he asks, "do I need to carry Lee Press-On nails along with me to change out cards?" He has an excellent point - digital cameras are designed to (1) fit nicely in the pocket while (2) using off-the-shelf spring-loaded SD card readers. Having sufficient room to operate the camera - and this goes for many of the controls, too, not just the access doors - is a distant third. Look at the gargantuan relative size of my thumb in that photo, and you can see where this is headed! I don't have too many problems with the spring load as much as I do the ever shrinking, ever changing memory card format. There are about 20 memory card types out there. How is a consumer supposed to keep up with everything. Besides it doesn't bode well for keeping everything sync'd or changing memory between devices. So true, Tony, so true. Format wars are one of the nasty side effects of capitalist competition that take their tolls on the consumers!